Owing to my move, there was a moratorium on preserving things for a couple of months, but i’m finally back into it. Pickled Brussels Sprouts. 2/16. Iacopi had gorgeous ones on Saturday, so i pickled 9 jars of ’em today, all with black mustard seeds and stalks of green garlic and green onion, some with half of one of those deadly dried Ahi chiles, and a few with no chile at all. The October batches, listed separately, had no green garlic, of course. 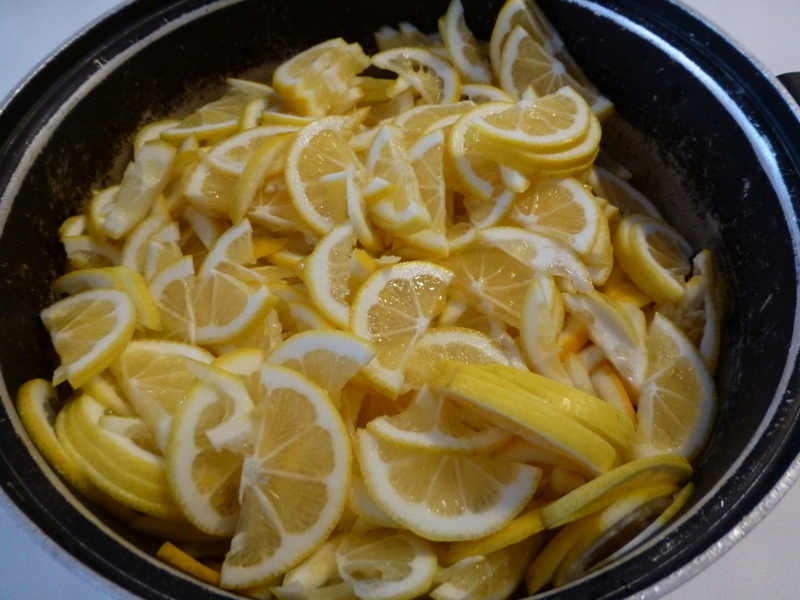 MLM – Meyer Lemon Marmalade. 2/22 Last Wednesday i went out to dinner with That Pig Jeff at Hoffman’s, and it was like Old Home Week since i hadn’t been there in a month and a half. Karen’s neighbor had given her a big box of Meyer Lemons, and Karen had made some into a superb lemon curd for a sublime lemon bar dessert. She also gave me a bag of ’em. Thus this marmalade. In honor of the special occasion, i spent an hour thinly slicing the lemons rather than just throwing ’em into the Cuisinart. Doesn’t really taste better with the lemons sliced, but it sure does look a lot nicer on your toast. Here’s what they looked like in the pot after slicing. Pickled Snow Peas. 3/5. 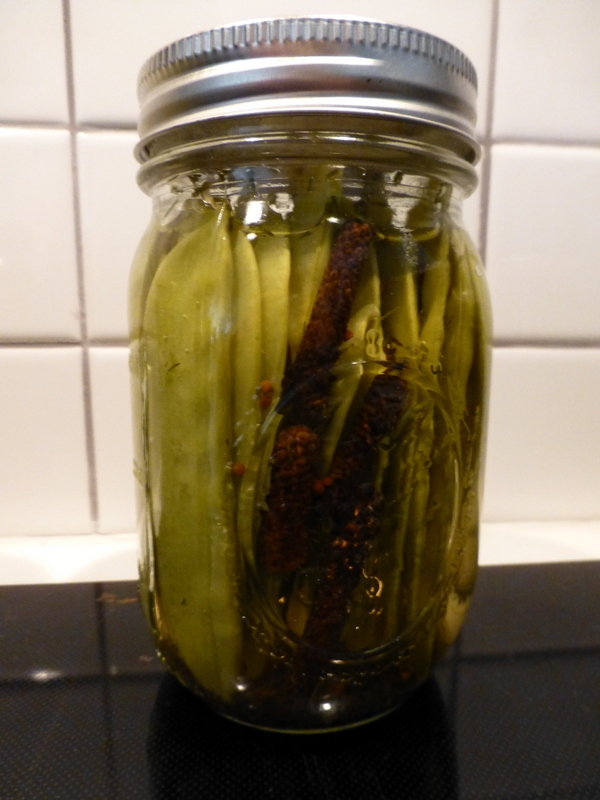 Picked up some nice looking snow peas yesterday at the Heart of the City Farmers’ Market and ended up with seven jars of pickles, adding a length of fresh green garlic, some black mustard seed, some dill weed, and several long black peppers (Piper longum) to each jar. Found more at that market on 4/8 and made ten more jars. Still more (and better ones) at the Noe Valley Farmers’ Market on 4/11 and did seven more jars since they went over so well last year. Another small batch on 5/10. Several more batches later. Paul’s Pickled Sugar Snaps. 3/22 and numerous dates afterwards, some with hot chiles. I pickled these with a stalk of green onion, dill seed, mustard seed, and long pepper. And talk about serendipity, last summer i gave my LA friend Paul a jar of these that he stuck back waiting for an occasion. He ended up taking ’em to a barbecue the other day, and he was kind enough to to send me an email about how well they’d gone over. So i’m naming this batch after him. Here they are in the stringing. And with the seasoning. 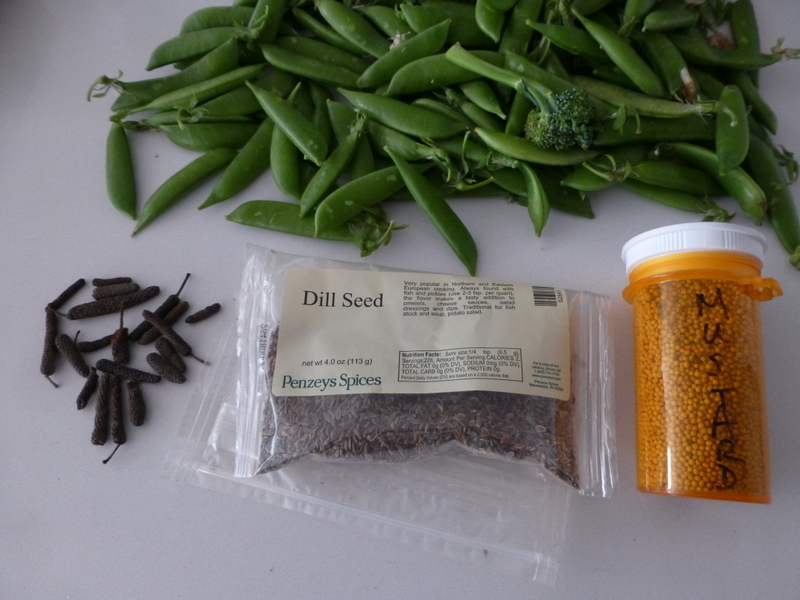 I gotta mention that the Penzeys dill seed was a gift and of good quality, but i normally buy my herbs and spices at Rainbow Grocery, Casa Guadalupe, and SF Herb Company. If you don’t know SF Herb Company, check it out. Package sizes run a bit too large for items you don’t use much, but the quality is excellent and the prices are unbeatable. 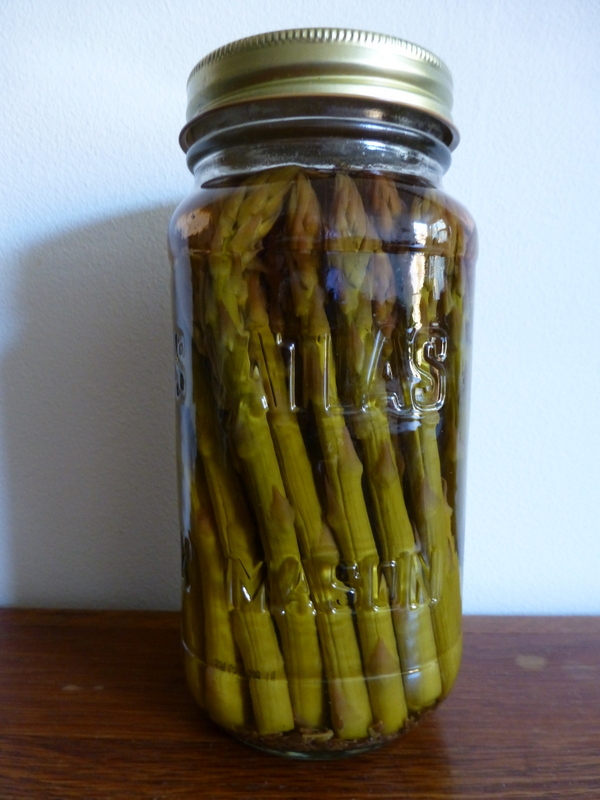 Pickled Asparagus – 3/26. Marie at Rodin Farms suggested i try this, and luckily my favorite asparagus vendor is just two stalls down the row. Marie and i tried ’em on 4/1 and felt i’d overprocessed them, so i made three jars on 4/2 with no processing other than heating the stuffed jars in a waterbath for a minute before pouring in the boiling pickling fluid. Took one to the market on 4/8, and we agreed that the secret to pickling asparagus is no processing at all. Just pack ’em in sterile jars; add the dill seed, long pepper, and mustard seed; set the jars in an inch of simmering water for a minute, fish the jars out, and immediately pour the boiling pickling solution into the jars and screw the lids on tight. As a deterrent to pathogens, i’m upping the vinegar for these to 3 parts water to 2 parts vinegar. Made three more jars on 4/9. Went ahead on 4/15 and made three jars with equal parts vinegar and water but am thinking that 3/2 water to vinegar is the best acidity level for asparagus. Kept making these on later dates until i ran out of tall jars. You want more? Bring me back the damn empty jar. MC – Mango Chutney. 4/2, 4/7. Mexican mangoes are in season, and i found some gorgeous ones for a good price at, of all places, Whole Foods. Thus, this chutney in which i used a too-moderate amount of New Mexico chile powder instead of fresh chiles. Used three full tablespoons of chile powder in the 4/7 batch, which is still not all that hot but which has a distinct chile powder flavor and thus tastes less Indian. SAL – Strawberry Jam 4/11. The strawberry season is in full operation now, so i got a flat from Yerena. Half went into this jam. SPK – Strawberry Jam with Patak’s Hot Lime Relish 4/11. I used the other half of that flat of strawberries for this spicy jam. Went ahead and threw in a handful of nigella seeds. Shoulda thrown in a bigger handful, as they add a pleasant crunch as well as their distinctive taste. No, nothing weird, so you’ll like it. CPK – Cherry Jam with Patak’s Hot Lime Relish. 4/30 When i went to the Castro Farmers’ Market on Wednesday i was delighted to see that Alpine Farms had cherries. Hell, they had two varieties, and i settled on six pounds of the Burlats for this first cherry preserve of the season. Oh, and i got plenty of Patak’s in this one! Yow. RCJ – Rainier Cherry Jam. 5/8 A plain cherry jam from Alpine’s Rainier cherries. AAL – Apricot Jam. 5/14. Marie at Rodin Farms had her first apricots yesterday, so i made a jam of them this morning. As an experiment, i chopped a salt-preserved lemon into this one in addition to the lemon juice and shredded apple, thinking that might add a little flavor complexity. BCJ – Bing Cherry Jam. 5/20. Good Bing cherries from Alfieri made a flavorful jam. Oh, and i boosted them with one teaspoon of Patak’s Hot Lime Relish, the idea being to amplify other flavors without the relish being more than just barely detectable. It worked. CCJ – Chelan Cherry Jam. 5/28. Yesterday Alfieri had a cherry variety that i didn’t remember, “Chelan”. Tasted one and WOW! So i made a jam of them using two teaspoons of Patak’s, which turned out somewhat more detectable than the one in the previous Bing jam, but still gentle. RB – Raspberry Jelly 5/29. Plain old raspberry jelly that didn’t set very well. BB – Blackberry Jelly 5/29, 7/3. Plain old blackberry jelly that set better, especially the second batch. CCCJ – Coral Chanel Cherry Jam. 6/4. Got these delicious cherries yesterday at Alfieri and this morning as i was making the jam googled “coral chanel cherry” to get more information on them. No hits. Tried various alternate spellings. No hits. So either Alfieri has secretly bred this variety and was testing it on consumers before publicizing it, or his staff got the name terribly wrong. In any case, they’re excellent cherries and made a good jam. (Late note: talked to Erika at Alfieri and learned that she didn’t know where whoever wrote that sign came up with “Coral” but that “Chanel” was a typo and that they were really just Chelan cherries. No wonder they tasted so good.) I went ahead and threw two heaping teaspoons of Patak’s into this batch. Still not excessive, so i’ll add more next time. TB – Tayberry Jelly. 6/5. Yerena has his tayberries at the market now, so here’s jelly of ’em. NPJ – Nectarine Pasilla Jam 6/5. Full disclosure: in addition to a couple of chopped Pasilla chiles, i added a teaspoon of Patak’s and two teaspoons of chile powder. NAL – Nectarine Jam. 6/6, 6/17. Plain old boring nectarine jam with nothing in there but nectarines, sugar, the pulp of an apple, and the juice of a couple of lemons. TBPK – Tayberry Jelly with Patak’s Hot Lime Relish 6/12. An old favorite jelly. BBN – Barbecued Nectarine Jam 6/15, 6/25, 7/29. This one was such a hit last year that i’m doing it again. And no, the nectarines are not actually barbecued. I just throw in some barbecue sauce and tomato paste. RCPK – Rainier Cherry Jam with Patak’s Hot Lime Relish 6/17. OK, one last cherry jam, this one with Patak’s. BCJJ – Bing Cherry Jalapeño Jam. 7/10. I lied. Alfieri had some late season Bing cherries that i couldn’t pass up. Added one medium seeded and deveined Jalapeño that’s just in there to brighten up the other flavors. You can just barely taste it, so you could probably sneak this one past the kids. Berry Vinegars. As usual, this year i’ve been steeping for a month in vinegar the seeds and pulp from many of my berry jellies to produce berry-flavored vinegars. These will be available through the fall. Chocolate Sauce. I make a batch of chocolate sauce at least once a month since it’s so popular. Sometimes plain, sometimes with a teaspoon of chile powder to heighten the other flavors while being barely detectable itself. Oh, and sometimes i succeed beyond my wildest expectations, like in the most recent batch that i tried to make richer by doubling the amount of solid chocolate and slightly increasing the sugar. What happened is that apparently i exceeded the carrying capacity of the liquid because this batch was wonderfully thick as i was bottling it while it was still very hot. Alas, as it cooled in the bottles, some of the sugar precipitated out and settled to the bottom while the upper parts were so thick that they needed to be spooned out. So what we have here is a crunchy chocolate paste that goes very well atop a mound of French vanilla ice cream but is unsuitable for making chocolate milk. NJAL – Nectarine Jalapeño Jam (8/2). Three seeded and deveined Jalapeños in this one, so you can taste ’em. CRC – Confiture Reine Claude (8/13, 8/22). Got back from my Portland adventure and returned to the Castro Farmers’ Market only to discover that Rodin Farms’ Greengage plums (Reines Claudes) ripened a week ahead of schedule this year. Thus this jam. FPAL – French Plum Jam. (8/14) No, this is not just another name for Confiture Reine Claude because these plums are not Greengages but rather the heirloom variety called variously “French Plums” (by, for example, Marie at Rodin Farms), “Italian Plums” (Mr. Arata from whom i bought them at the Mission Community Market), and “Sugar Plums” by others. NGAL – Niabel Grape Jam (8/18). Hamada now has this year’s crop of Niabel grapes, and the jam i made from them last year was such a hit that i did it again. The recipe for this jam is at the end of the “Jams, Jellies, Marmalades, and Chutneys” entry in the Recipes menu. 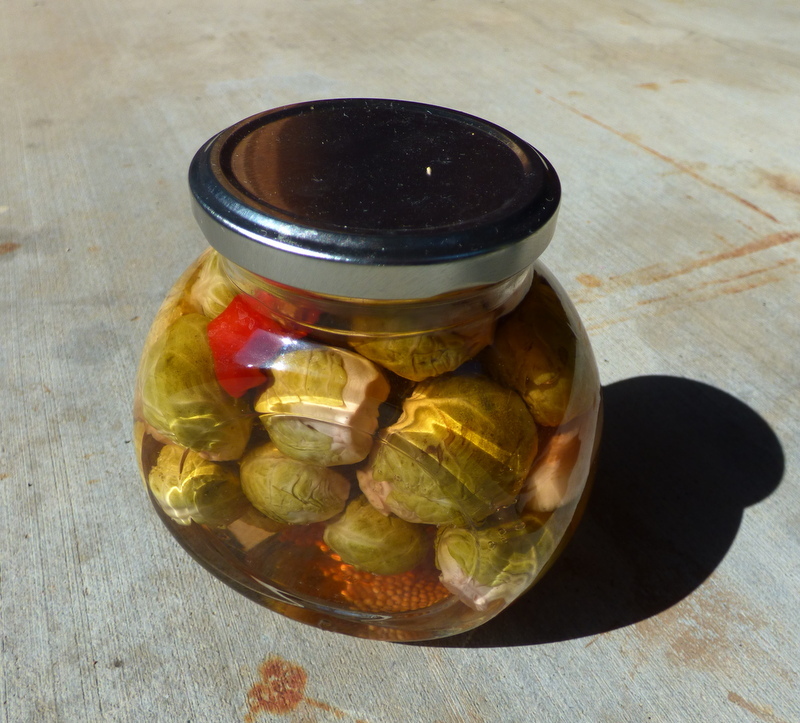 Pickled Brussels Sprouts (10/1, 10-5). Took a break from preserving things while i moved to Petaluma, but saw sprouts at Iacopi’s in the Marin Farmers’ Market that were too beautiful to pass up. So i pickled ’em. May be a bit on the crunchy side as i feared processing them so long they’d be mushy. 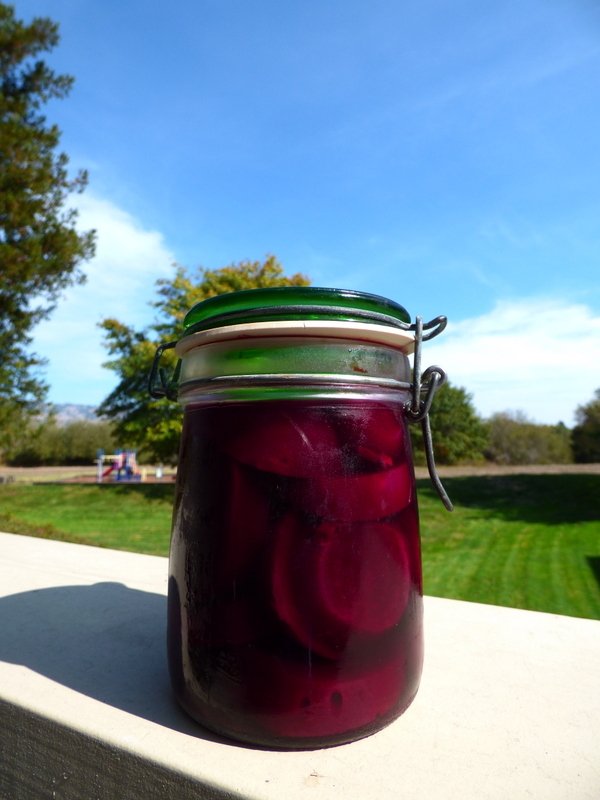 Pickled Beets (10/13). Picked up some beets at the Petaluma farmers’ market on McDowell Blvd this morning and pickled them using a traditional midwestern recipe although i cut back on the sugar. SPAL – Strawberry Jam with Padrón peppers (10/14). Got only enough of the peppers in to brighten it up a bit. BBRB – Blackberry Raspberry Jelly (10/16). On Thursday before my Spanish class i swung by the Mission Farmers’ Market in San Francisco and practiced my Spanish on Sr. y Sra. Yerena. While i was there, i picked up a mixed flat of blackberries and raspberries for this jelly. RLM – Rangpur Lime Marmalade (10/31). I had lunch a couple of days ago in San Francisco with sweet Carol at our favorite restaurant, Basil, and the event was made all the more enjoyable by her having at great labor gleaned every last Rangpur lime off her little tree. 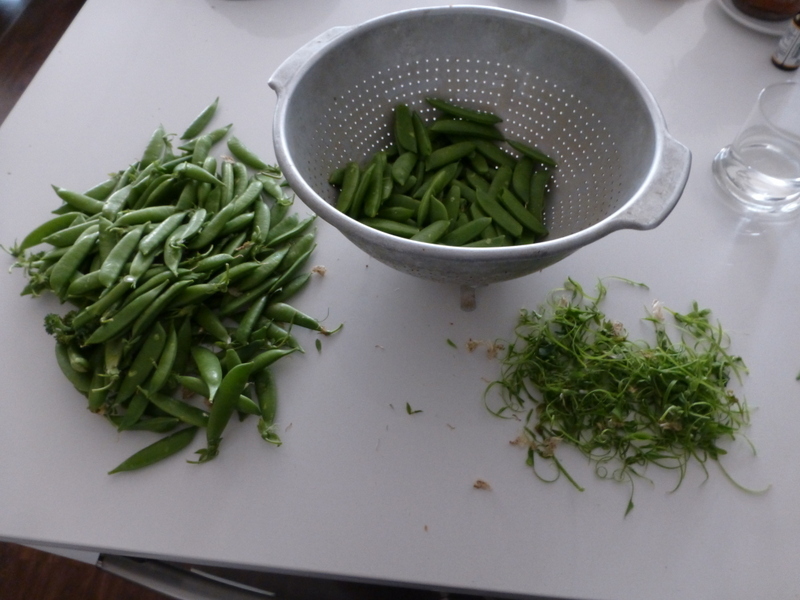 Very weak crop this year owing to the drought, but she got me enough for a couple of short batches. Nice people should submit an application for a jar of this treat. Really nice people might not need an application but should probably go ahead and submit one just to be sure. PAL – Pluot Jam (11/11). I spotted what just had to be the last of this year’s pluots yesterday at the McDowell Street farmers’ market and thought, why not? They’re the Flavor Fall variety, not the tastiest pluot but for sure the only one still available this time of year, which is certainly tastier than none. KLM – Key Lime Marmalade (12/3). I got five pounds of these from a vendor at the McDowell Street farmers’ market. Yes, they’re Key limes (Citrus aurantiifolia), but these were grown right here in Sonoma County even though the great majority of Key limes are grown nowadays in Mexico and are a very close variant of the Mexican lime, distinguishable only by a thinner skin that, unlike the Mexican variety, turns yellow when fully ripe. If you see Key limes in the market that are not yellow, they’re trying to trick you into buying the Mexican lime since Key limes command twice the price even though if i couldn’t see the skin i wouldn’t be able to tell the difference. 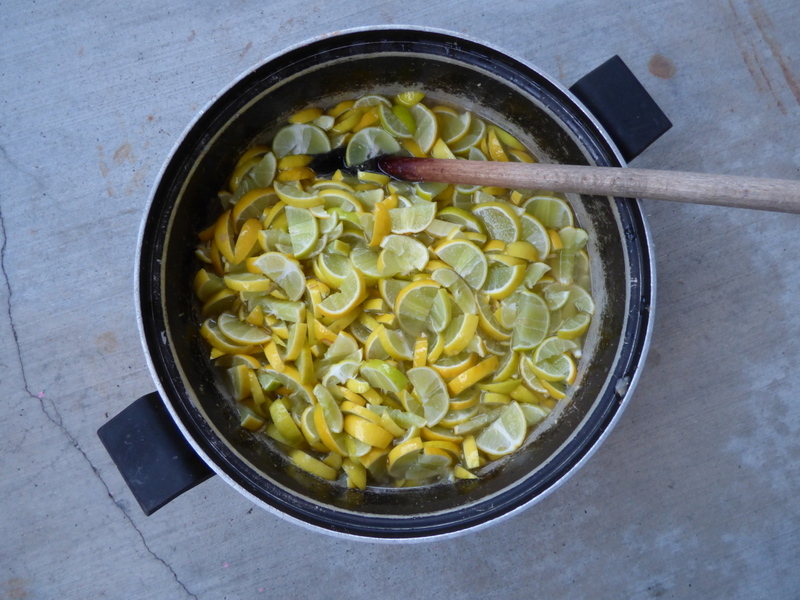 Anyhow, i’d never seen local Key limes and figured i’d make a marmalade of ’em. Turned out pretty good. 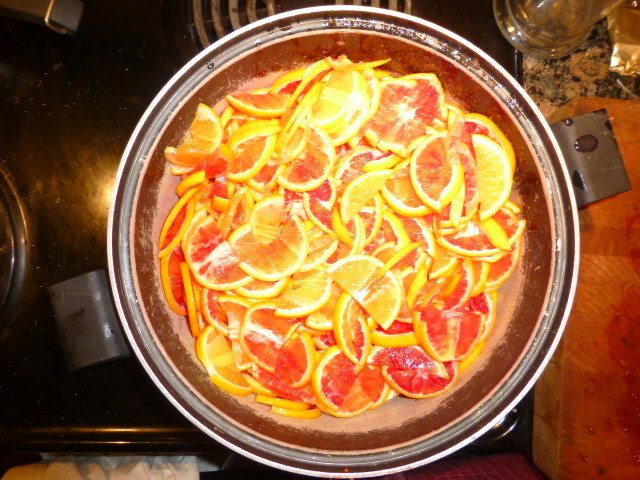 EBOM – Early Blood Orange Marmalade (12/13). Olsen came through this morning at the Marin Farmer’s Market with the five pounds of early blood oranges i’d ordered. I’d decided that catching blood oranges before they were dead ripe might make a better marmalade, so he brought me in some a couple or three weeks ahead of the expected harvest. I’m pleased with this marmalade, and i’ll make another batch for comparison when he brings the regular harvest in January. I’m not a big fan of blood oranges, as that “whang” they have has never really appealed to me, but i tasted a slice and notice that not only are these early ones much less sweet, they also have a sufficiently subtle level of that distinctive taste that i’m almost sorry i sliced up every last one of ’em into the pot. And yes, i said “sliced”. This batch is dedicated to my dear old friend Charmazel, so i thought i’d go ahead and hand slice ’em all rather than just quickly zapping ’em in my ancient Cuisinart. After all, the fruit for marmalades really should be hand sliced for better texture and appearance. Besides, the plastic processing vessel on that old processor is cracked and barely clinging to life, and i’m now reserving it for critical applications like making mayonnaise so it’ll last as long as i do. Paul here: I am honored – and only hope that I can enjoy the next batch!!! Well, that review catapulted you to the top of the list for this year’s version.